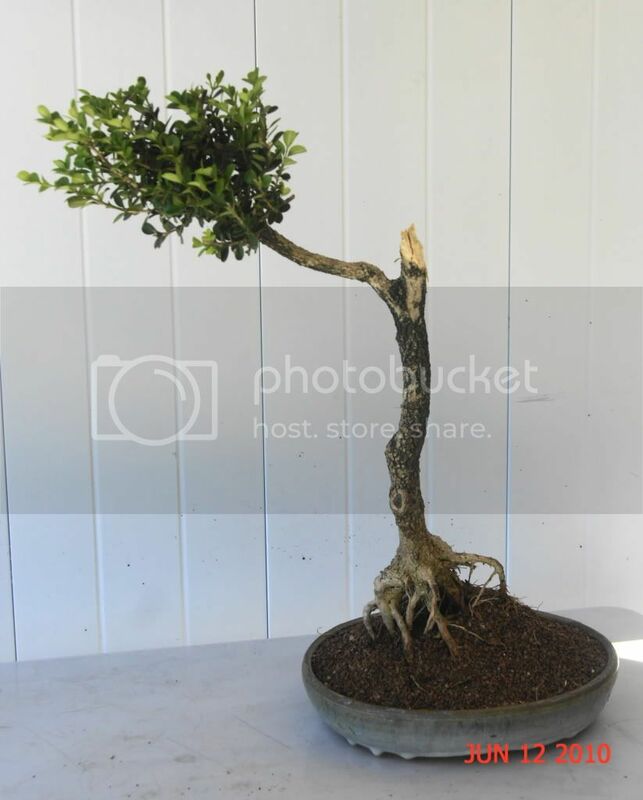 I acquired this old boxwood several months ago and didn't do much to it while I thought about what to do. I actually decided to do what someone suggested on another forum, and I'm happy so far with the results. Gradually, I want to train the pad in a downward arc. The pot is a signed Max Braverman pot from Pine Garden Pottery c. 1980. Zoot, I'm studying your tree and can't help wondering if, because of your wonderful exposed roots, you might consider doing a ROR in the future? With the last photo I envision the placement of a nice rock, lava type perhaps, into the pocket of roots, and a tilt of about 45 degrees over this rock so that the branch becomes the apex - in a more upright position. Sorry, I can't do a 'virtual' for you. But I see a nice change of style in my head. Hope you can see what I mean. 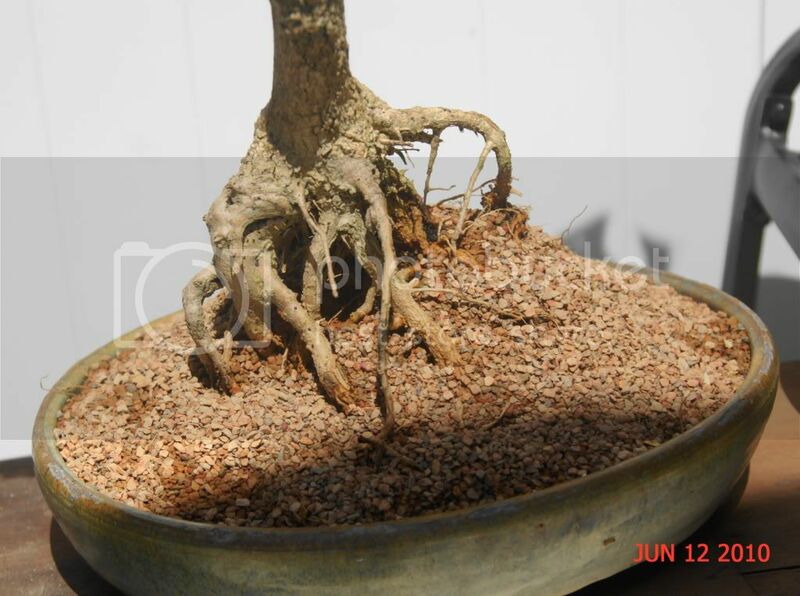 a ror would be very un appealing due to the heavy old roots which would not create the desired roots over the rock but an unnatural looking roots above the rock to achieve this style the tree would need roots thiner and more feeder-like. Thanks to each of you for your totally perfect comments. Will B's (From IBC) advice on this tree was spot on... it's really the only thing which could have been done with it. It should respond very well... and look nice in short order. 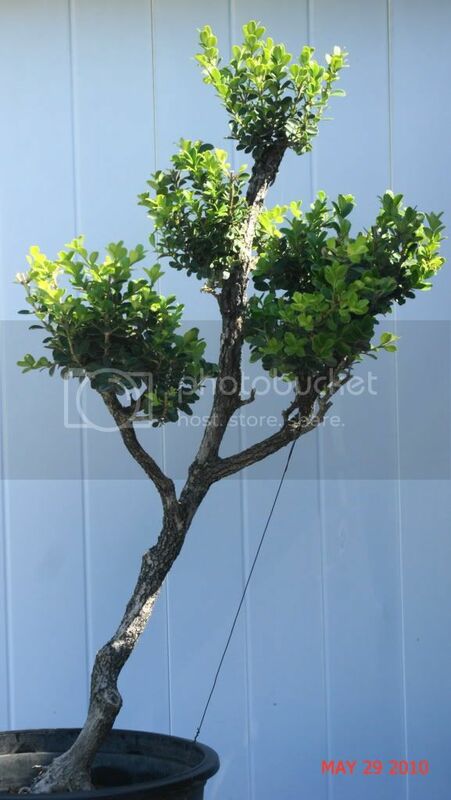 FYI - if you are not aware of this... Boxwoods don't like acidic soil... so it can be good to add a little lime to the feeding regimine to help them out. Also don't be overly surprised if the leaves get orange for a while... that is a sign of stress, either from winter/lack of light, or root stress... ie you just replanted it. Generally the leaves will recover their green color, so be patient and don't just remove them if it happens.